Since 1998, Qtools has been building software tools for accounting and bookkeeping professionals, and small business owners. Most Qtools products are specifically designed for QuickBooks® users. However some, such as our deposit slip creator Qslip, and the Qxtender CA DE-542 Plugin, also accept data from other sources or manual data entry. A host application for plugins that primarily extend the capabilities of QuickBooks Desktop editions. (some Plugins do not require QB to perform their function -- see Plugin pages for more information). Plugins operate in one of four Data Modes. Why four? Each has different advantages depending on such factors as the version of QuickBooks or the data requirements of the Plugin. In QB Integrated Application Mode, Qxtender connects to the QuickBooks Integrated Applications interface and retrieves data from the currently open company file. Currently supports QuickBooks versions 2006-2019 and Enterprise 6.0-19.0. In QB Application Controller Mode, Qxtender performs user-interface automation to control the QuickBooks application and retrieves data from the currently open company file. Currently supports QuickBooks versions 2006-2019 and Enterprise 6.0-19.0. In Export Mode, Plugins read data files exported from QB (and other formats in some cases). Currently supports QuickBooks versions through QB 2019, Enterprise versions through 19.0. In Manual Data Entry Mode, no data is imported. Not all Plugins currently support all Data Modes. Please see the Plugin pages for information on which Data Modes are supported. October 25, 2018: Qxtender 3.40 released. QB 2019 and QB Enterprise 19.0 now supported. 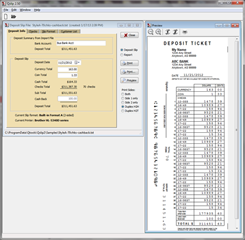 Qslip can print complete deposit slips on plain paper, including the MICR line. QuickBooks Online Edition import now supported. Qslip also prints deposit information on your own pre-printed deposit slips in a snap - including 2-side formats. You can either enter the information directly into Qslip, or Qslip will import deposit data from export files produced by QuickBooks or generic formats exported from other applications. 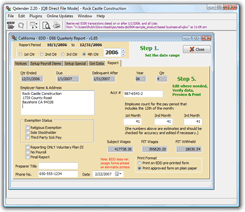 Deposit Slip formats are completely configurable. You can choose to print any combination of bank number, check number, customer name or memo in the check listing on the deposit slip. Bank numbers can be entered in the memo field for QuickBooks imports. If not imported, check and/or bank numbers can be entered in Qslip prior to printing. Once Qslip is setup, the import process is very quick and easy. Qslip will load the file on startup and all you will have to do is place a blank deposit slip in your printer, possibly edit the coin and currency amounts, click "Print" in Qslip - and you're done! Tired of filling out bank deposit slips by hand? Frustrated by errors and wasted time? Is the 18 checks per QB deposit slip not nearly enough? Do you get checks that pay invoices for more than one customer? Want to print the aba# or chk# or customer name on the slip next to each check? Qslip maintained customer list to speed data entry: recalls bank numbers on imported deposits, and performs auto-fill of customer name and bank number on user-entered deposits. Supports QuickBooks 99 & up native deposit slip format. Optional Depositor Name, Address, Account#, Bank Name & Address fields. Imports deposit information from QuickBooks and generic import files. QuickBooks, QuickBooks Pro, QuickBooks Premier & QuickBooks Enterprise are registered trademarks of Intuit, Inc.